Joel Hoekstra may not be as familiar a name as some other guitarists, but it's a name you should really know. He was a member of Trans Siberian Orchestra and Night Ranger before leaving to join Whitesnake - and that should tell you just how good he is as you don't get to be in bands of that calibre without being very talented. I must confess to being quite cynical, so when I hear about a guitarist releasing a solo album, my first thought is usually that it's going to be instrumental or a series of guitar solos with some token vocals added so the focus is always on the guitar. Sadly I've heard plenty of albums like that and to be blunt they mainly interest obsessive fans or other guitar players. Happily though Joel Hoekstra hasn't taken this route with this album but instead has created a proper album full of well crafted songs with great vocals not just great guitar work. For this album he's brought in some impressive talents including Jeff Scott Soto and Russell Allen on vocals, Vinny Appice on drums, Tony Franklin on Bass and Derek Sherinian on keyboards. The list of musicians and singers is enough to tell you that the aim of this album is not to showcase Joel Hoekstra's impressive guitar skills, but is actually to create a top quality rock album, and that is what they've achieved. The album kicks off with a fairly heavy track - "Say goodbye to the sun", and right from the start it impresses. From there on the album is incredibly strong - not a single weak track to be found. Both Russell Allen and Jeff Scott Soto do an excellent job on the vocals, and Joel Hoekstra plays some superb guitar - strong riffs, great solos, but it's never overstated and keeps within the confines of what makes a great song. 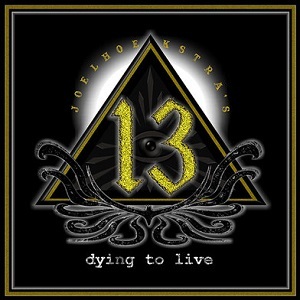 "Dying to live" is a fantastic album - great songs, great vocals and great guitar work - what more could you ask for? It's one of the best albums I've heard all year.